- Paul John Faeldo on 三月 7, 2017. LEGOLAND® Discovery Centre Toronto presents a special event that celebrates the LEGO BATMAN MOVIE taking place on the weekends of February 25/26 and March 4/5, 2017. Located in one of the largest shopping centers in Canada, Vaughan Mills, we got an exclusive tour provided by General Manager Rene Gurtner to see what this indoor family attraction has to showcase; especially all things Batman. After being featured in the LEGO MOVIE, the Caped Crusader stars in his own big-screen adventure, which is now playing in theaters. However, LEGOLAND will not be showing the film at their Centre. At LEGOLAND Discovery Centre, we get a walkthrough of the venue starting off with the Lego Factory Tour. Here we can see how LEGO bricks are made. From mixing to heating to molding to painting, we explored a pretty cool interactive process that demonstrated how raw plastic is transformed into the colorful LEGO bricks we love. After that, we stepped into Kingdom Quest. Kingdom Quest is a fun ride you can enjoy with the family by hopping on a chariot to rescue the captured princess while zapping the trolls and skeletons. Once finished with the ride, guests can line up for pictures and souvenirs before heading to MINILAND. Built from over a half a million bricks, in MINILAND you will see miniature replicas of Toronto’s landmarks. The attention to details will make you feel in awe as this attraction showcases buildings recognized by all such as the CN Tower, Nathan Phillip Square, and Rogers Centre. Where all the real fun happens is the open space filled with interactive attractions for children and their families to enjoy. Visitors can start off by taking a seat back at the LEGO 4D Cinema. 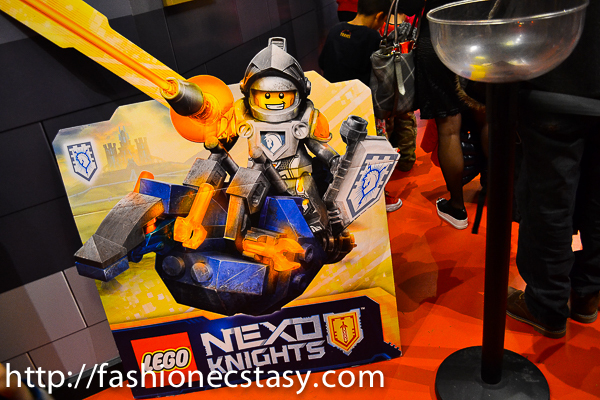 One of the rooms featured a 15-minute short film called LEGO NEXO KNIGHTS. Once put on the 3D glasses, you are taken to an adventure where you get to experience the action unfold and become part of the scene as flurries, wind, rain, and lightning burst in the auditorium. Four movies rotate throughout the day. Like one giant playground, LEGOLAND offers many activities for children and families to play and participate in, including LEGO Racers Build & Test, Earthquake Tables, Duplo Village, LEGO Friends, LEGO City Play Zone, LEGO Master Builder Academy, and Merlin’s Apprentice. To take a break from all the fun activities, rest at the LEGOLAND Cafe, where Birthday Party rooms are available for booking. You can even purchase LEGO themed lunch boxes and more LEGO BATMAN swag. To celebrate all things Batman, what better way to spend your day at LEGOLAND DISCOVERY CENTRE than meeting LEGO BATMAN himself? Included with the admission, fans can meet The Dark Knight via photo ops, scavenger hunts, and build activities. Once satisfied with the event, visitors can stop by at the LEGOLAND Discovery Centre Toronto Shop for any last minute shopping for toys, accessories, swag, and souvenirs before leaving. It would be ideal to purchase tickets online ahead of time to guarantee a spot and avoid special events. For tired moms/dads who need a break, there are even adult nights where you can indulge in LEGOLAND with no children involved. For a list of planned activities, attraction hours and ticket prices visit www.legolanddiscoverycentre.ca.